With the "S.A.F.E. "-titles still showing this Boeing 505 LN-BRS (c/n 24649/2225) is gaining speed for take off (SPL 1998). SAFE stood for South American Far East Airtransport AS and dates back to the foundation of this airline by Ludvig G.Braathen on 26Mar1946. During those early days, the airline operated charters to South America and Hong Kong. From 1952 a domestic route network was started in Norway, using DeHavilland Herons and (from 1958) Fokker F.27s. Jets, in the shape of Boeing 737s, were introduced in 1969. 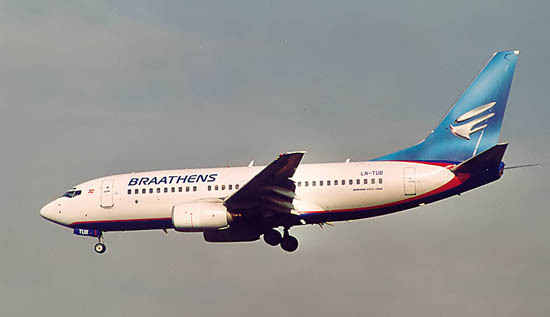 Braathens's Boeing 737-505 LN-BUE (c/n 27627/2800) is seen here getting a push-back at London-Gatwick (LGW) on 07Aug00. 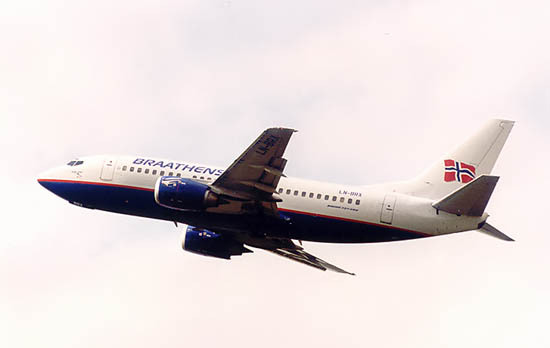 In 1997 KLM Royal Dutch Airlines acquired a 30 % holding in Braathens S.A.F.E. and Braathens became a common sight at Amsterdam IAP. 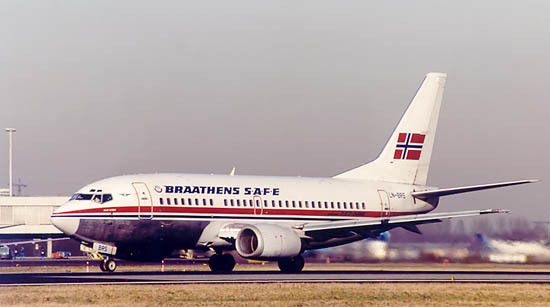 The SAFE suffix was dropped (officially, it was not removed from all planes) in 1998 when Braathens adopted a new corporate identity. This take off shot depicts a change in the livery: a flying flag and blue underneath, as seen on this Boeing 737-505 LN-BRX (c/n 25797/2434) during April 2000. The strategic alliance with KLM lasted only a few years, KLM offered its share to SAS in 2001. Quite a departure from the 'safe' colourscheme worn previously, but this colourscheme (introduced during the year 2000) met with outrage, both from customers as well as Braathens' own staff and measures were taken to discontinue this livery change and to remain with the previous one..
During 2002 SAS received permission, by EU Brussels, to take over Braathens, subject Braathens was to sell 20% of its fleet (worth usd125 million). 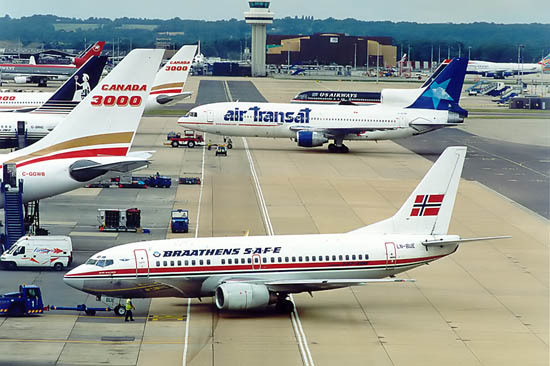 In 2004 SAS Braathens was to become the new name for Braathens A/S since its takeover by SAS (commencing June 2004) and was rebranded as a low-cost, no-frills company (these companies became known as "LCC's").